Most of the Indian families have 3-4 members and they need a washing machine of 6 to 7 kg capacity. In this article, we have covered the top 10 best washing machines under 30000 available in India as of January 2019. All the washing machines on this list are top load or front load fully automatic washing machines. The criteria for selecting these machines was that they should have good build quality, a motor of decent power and good after-sales service. Washing machines have a lot of moving parts and they tend to break down after some time so good after sales service is an important factor. On this list, you will see washing machines from all major brands like LG, Samsung, Whirlpool, Bosch, and IFB. Fully automatic front loading washing machines require no intervention while running and are great for saving water as well. You just need to put in the clothes and detergent, select the wash program and the washing machine will do everything on its own. The washing machines on this list are priced between 25000 and 30000. If you have a lower budget then take a look at best washing machines under 25000. Now, let's take a look at our list of best washing machines under 30000 and then we will take a look at brief review and pros cons of each washing machine. Whirlpool has limited options in the fully automatic front load machine and this is one of the best front load machine available at around Rs. 25000. It has a capacity of 7Kg and is suitable for a family of 3 or 4 members. The machine comes with 12 wash programs to choose between the types of clothes and type of wash required. There are separate controls to adjust the temperature between 20 to 90 degrees. This Whirlpool washing machine comes with additional features like adjusting the spin speed or adjusting the start delay(after 3 hours, 6 hours or 9 hours) so that you can schedule it to perform its operation even if you are not at home during that time. The 6th Sense SoftMove Technology, customizes the drum movement according to the type of cloth to remove the stains. It also has a Steam Technology, that keeps your cloth fresh and removes bacteria by generating bacteria. The easy ironing feature washes and rinses the cloth in such a way that there is very less formation of the crease so that clothes can be easily ironed. For the color sensitive clothes, there is a separate wash program that washes the clothes at a low temperature of 15 degrees to protect the colors. The motor has a high rpm of 1000 and has an A+++ energy efficient rating so that the machine consumes very less power. It comes with a 2-year warranty on the complete machine and 5 years on the motor. Overall, with a Whirlpool brand same and quality, it is a good fully automatic machine in the pricing. Samsung is one of the top brands in the consumer electronics market in India. They continue to be on top because of their quality products and excellent after-sales service. This front load washing machine from Samsung comes with 8 Kg capacity which is suitable for a family of 4-6 members. You can also wash your heavy quilts/jackets in this without any issues. As it is a fully automatic washing machine, a minimum manual effort is involved in just putting the clothes, detergent and switching it on. Then based on your requirements and type of cloth you can use any of the various options available. With these type of machine, you get an option to adjust the type of cleaning based on the type and wash required. The motor is powerful and has a good RPM of 1200. Plenty of wash programs are available as well. There is a heater inbuilt which helps with tough stains and you can also keep the clothes soaked in warm water. Overall, it is a good option from Samsung. Go for it if you like Samsung and need a washing machine in Rs. 30000 to 35000 range. This is one of the highest capacity washing machines in the top load fully automatic category from Whirlpool. It has a capacity of 7.5 Kg and is suitable for a family of 4-6 members. It is built of stainless steel and has 12 wash program and 4 drier functions. It uses 6th SENSE Tumble Care technology that rotates the water in a manner that the clothes are properly washed. It comes with a unique feature of a hot shower in which the machine pours hot water mixed with detergent from a shower with force for effective cleaning. This machine is also equipped with special features that ensure that the detergent in perfectly mixed and is not left on any clothes. The water stream and cloth rub against each other with the help of 360-degree Tumble Motion technology that improves the cleaning effect. 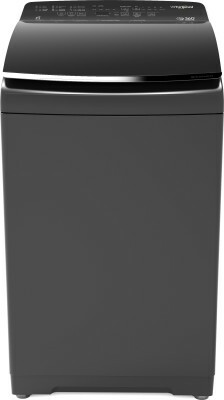 With other great features like power dry, ultra clean, this washing machine from Whirlpool is easily one of the best top load fully automatic machine under 30k for those who need a high capacity washing machine. The build of the machine is good and motor power and rpm are decent as well. It comes with 2-year complete product Whirlpool warranty and a 10-year warranty on motor. Whirlpool has a good after sales network and they are very responsive as well. IFB is probably the best and our favourite brand when it comes to front-load fully automatic washing machines. This is another excellent front load machine from IFB with a good capacity of 7 kg suitable for a family of 4 members. The motor is very powerful and has a RPM of 1000. This machine has 100 wash programs and has an inbuilt heater as well which is useful if your clothes have tough stains and allows you to adjust the temperature using the knob. It comes with Air Bubble Wash System that creates a lot of air bubbles to seep into clothes and keep effectively. IFB machines also have Auto Imbalance System which redistributes the clothes in case they are unevenly distributed when you put the clothes in the machine. IFB offers a 4 years warranty on their front load fully automatic washing machine which is the best thing about it. IFB has good after sales network, so if anything goes wrong with your washing machine for next 4 years, they will fix it. One of the best fully automatic front load washing machines under 30000 in India. IFB is a well-placed brand in the washing machine segment. This IFB washing machine is fully automatic with a top loading mechanism and has a high capacity of 7.5 Kg making it suitable for families with 4-5 members. It has a very solid build quality and has a stainless steel drum which is highly durable. Let us check the features and performance now, this machine comes with a motor rated at 370W and has an rpm of 720 which is very effective for properly cleaning the clothes. With its huge capacity, it is able to clean the clothes without getting them tangled, so there is no detergent left on the clothes. It comes with 9 programs like Jeans, Delicate, Blanket etc to adjust for different types of clothes. This IFB machine has a 3D Wash System which circulates the water in a manner to perfectly dissolves complete 100% of detergent resulting in clean clothes. It has a display that indicates the water level, timer and other settings as per chosen by the user. There is also an option to adjust the temperature of the water between cool, warm and hot so if your clothes are very dirty, then you can choose the hot option. In case of winters, you can try the warm option so that you can conveniently wash the clothes. IFB has good service after sales due to its huge network of service centres and has 2 years of warranty on the complete product. In case you are looking for an IFB washing with lower capacity, you can check this option on Amazon. So this was our list of best washing machines under 30000. We hope it was helpful and you were able to find a suitable front load or top load fully automatic washing machine. If you can spend around 4000-6000 more then do go through our post on best washing machines under 35000 to 40000. 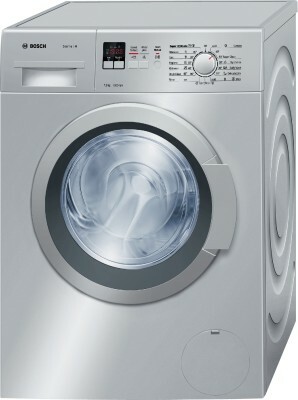 Bosch 7 Kg front load fully automatic washing machine is our favorite under 30000. Bosch is a great brand in the washing machines category and is known for high-quality products. This washing machine from Bosch looks great and wash quality great as well.